Legend has it that Kamehameha I, during his military campaign to unify the Hawai’ian islands, was chasing two non-combatant fishermen when his foot became caught in the reef. He was struck on the head by one of the panicked, fleeing fishermen with an oar, which broke and splintered into pieces. Kamehameha could have easily been killed at this point but the fisherman spared him. 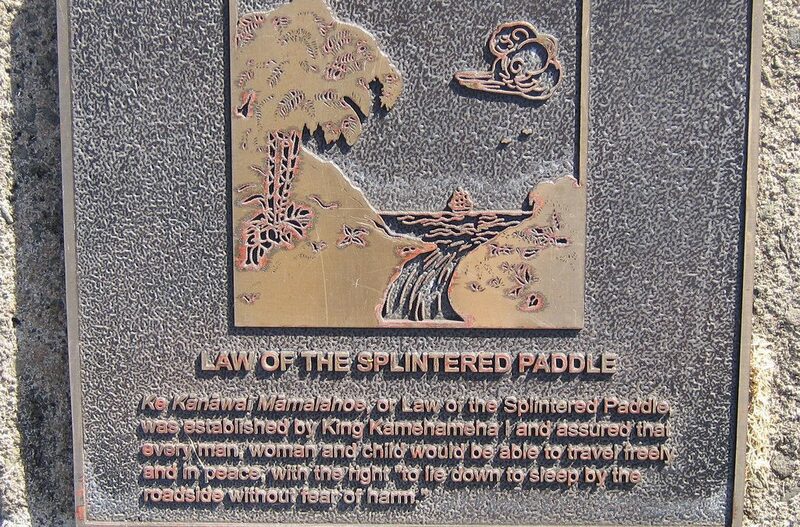 From this, the enlightened King derived the Law of the Splintered Paddle, Kānāwai Māmalahoe: that the legitimacy of any government lies in the goodwill of it’s people, and that to molest or kill the innocent in order to achieve an end was an effrontery not only to God but to humanity. 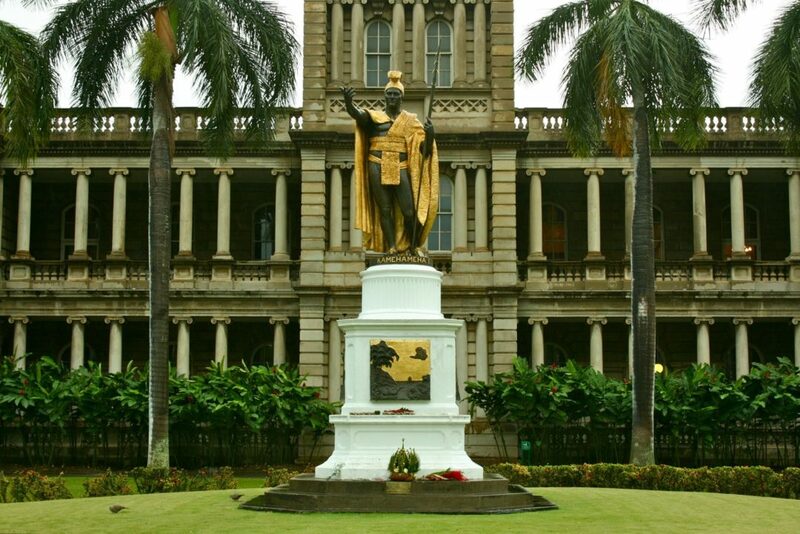 The statue is of the first Hawai’ian King, installed in 1883 in front of the Aliiolani Hale, which was designed as a palace and is now the home to the State’s judiciary. The plaque, one of four, was installed in the curbing that surrounds the statue in 2005 to add interpretation to the large graphic panels on the statue’s base. The law, “Let every elderly person, woman and child lie by the roadside in safety,” is enshrined in the state constitution, and is considered a key milestone in human rights jurisprudence. The complete 1787 law, as written by Kamehameha I, reads: Oh people, \ Honor thy god; / respect alike people both great and humble; / May everyone, from the old men and women to the children \ Be free to go forth and lie in the road \ Without fear of harm.\ Break this law, and die.